In part 1, we set up VNet to VNet connection from West US to East US. In this part, I'm going to create 1 more VNet in North Europe and then set up the VPN from North Europe to West US. 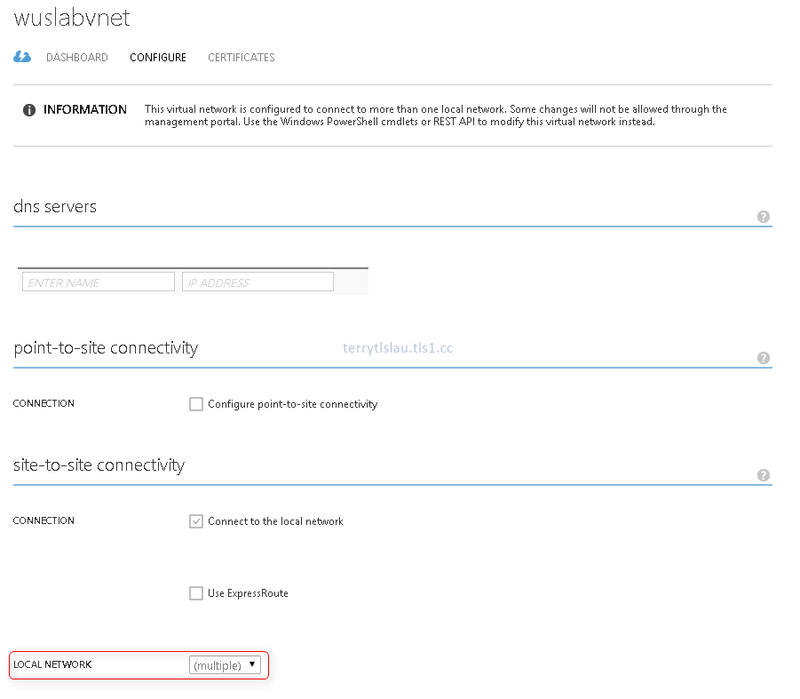 To set up multi-VNet connections, we cannot complete this action on Microsoft Azure Portal. We have to download and modify the current VNet configuration file and then upload the updated configuration file to Microsoft Azure. First, we need to download the current VNet configuration file and then add the new virtual and local network into configuration file. 1. Launch "Azure PowerShell" as administrator on a workstation. 2. Connect to your Azure subscription by performing "Add-AzureAccount". 3. Perform "Get-AzureVNetConfig -ExportToFile C:\VNetConfig.xml" to export the VNet configuration to C:\VNetConfig.xml. 4. Open "VNetConfig.xml" in "Windows PowerShell ISE" as administrator and then focus on Local Network Sites first. There are 2 local network sites under our vnet configuration. We need to add a new local network for North Europe region. 5. Copy from <LocalNetworkSite> to </LocalNetworkSite> and then paste it under </LocalNetworkSite> of wuslabvnet. 6. Change the name, AddressPrefix and VPNGatewayAddress to nelabvnet, 10.3.0.0/16 and 172.16.0.3. The latest local network configuration will be the following. Then, we need to add a new virtual network and update "Connect to local network" in this virtual network configuration file. 7. Copy from <VirtualNetworkSite> to </VirtualNetworkSite> and then paste it under </LocalNetworkSite> of wuslabvnet. 8. 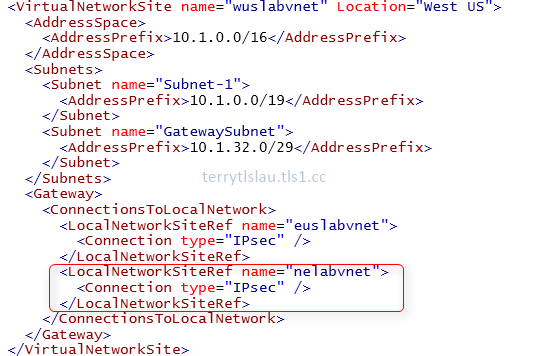 Change the name, Location, AddressPerfix and LocalNetworkSiteRef to the following. 9. Then, we need to add 1 more LocalNetworkSiteRef named nelabvnet under wuslabvnet. Eventually, we have the following virtual network configuration. 10. Save the VNet configuration. 11. 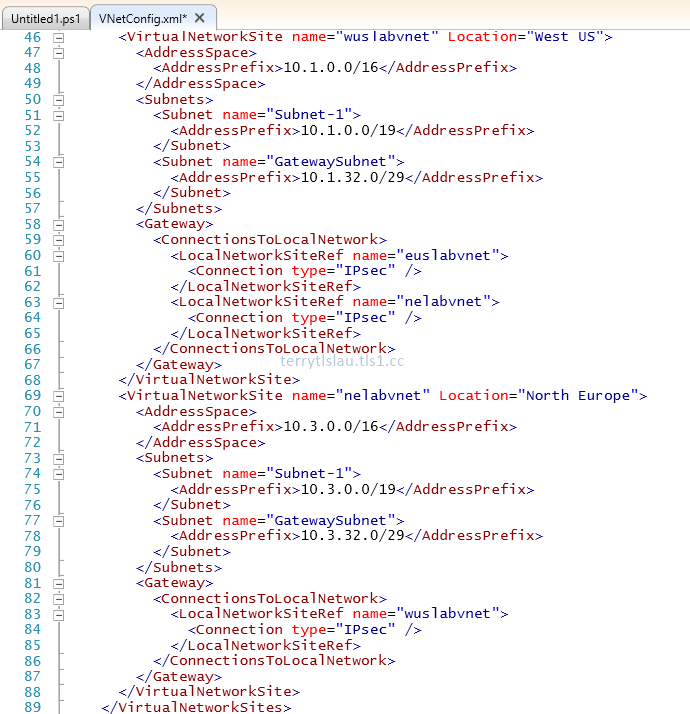 Back to Azure PowerShell console, perform "Set-AzureVNetConfig -ConfigurationPath C:\VNetConfig.xml" to update VNet configuration on Microsoft Azure. Click to wuslabvnet virtual network, the portal will display the 2 virtual network connection. However, we haven't created a gateway on nelabvnet and set up shared key for both VNets. The Local Network option of wuslabvnet was configured to multiple. We cannot configure this on Microsoft Azure Portal. 12. 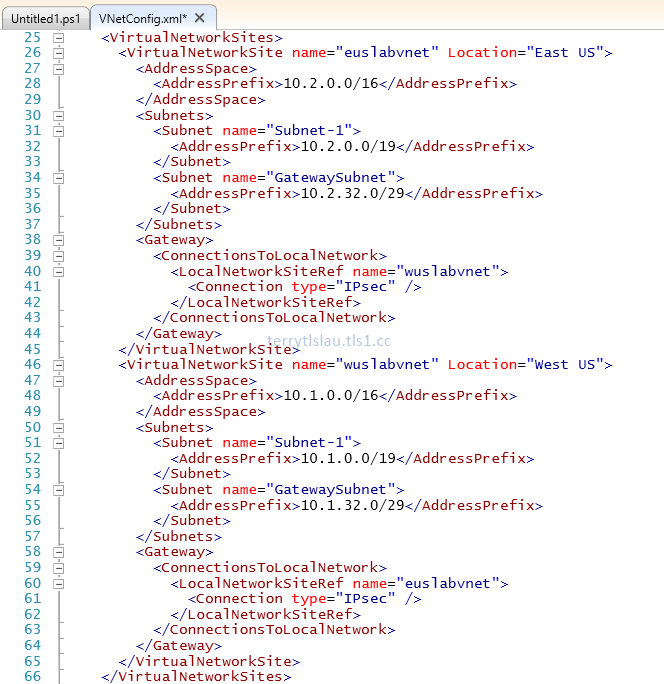 Back to Azure PowerShell console, perform "New-AzureVNetGateway -VNet nelabvnet -GatewayType DynamicRouting -Verbose" to create a new dynamic gateway with dynamic routing for nelabvnet. Remark: It takes 15 - 30 minutes to create a gateway. 13. Perform "$GIP = (Get-AzureVNetGateway -VNetName nelabvnet).VIPAddress" to get the gateway IP address of nelabvnet and then save it to $GIP variable. 14. Perform "$xml = [xml](Get-Content C:\VNetConfig.xml)" to get the xml content and save it to $xml variable. 15. 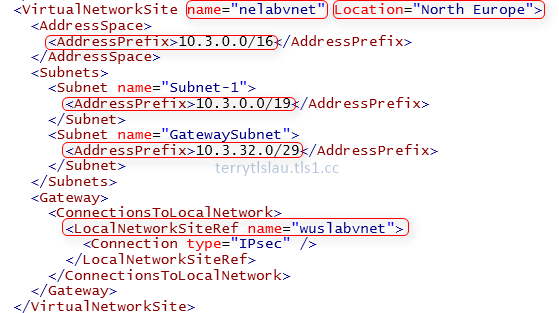 Perform "($xml.NetworkConfiguration.VirtualNetworkConfiguration.LocalNetworkSites.LocalNetworkSite | where name -eq nelabvnet).VPNGatewayAddress" to get the gateway IP address of nelabvnet in the vnet configuration file. 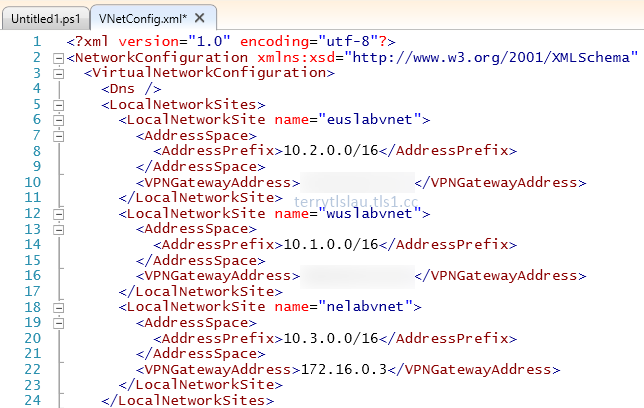 We entered a temp gateway IP address for nelabvnet local network in the configuration file. Now, we need to update the configuration file and then upload to Microsoft Azure to update the virtual network settings. 16. Perform "($xml.NetworkConfiguration.VirtualNetworkConfiguration.LocalNetworkSites.LocalNetworkSite | where name -eq nelabvnet).VPNGatewayAddress = $GIP" to update the IP address. 17. Perform "$xml.save("C:\VNetConfig.xml") to save the updated content into the virtual network configuration file. 18. 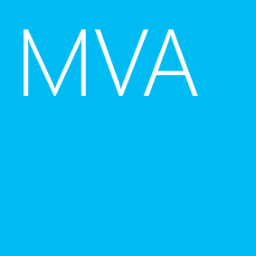 Perform "Set-AzureVNetConfig -ConfigurationPath C:\VNetConfig.xml" to update virtual network configuration on Microsoft Azure. 19. Perform "$Gwkey = (Get-AzureVNetGateway -VNetName wuslabvnet -LocalNetworkSiteName euslabvnet).value" to get the current shared key between wuslabvnet and euslabvnet. Then, save it to $Gwkey variable. Remark: Get-AzureVNetGateway can get the shared key and show it as clear text. 20. Perform "Set-AzureVNetGatewayKey -VNetName nelabvnet -LocalNetworkSiteName wuslabvnet -SharedKey $Gwkey" to setup VPN tunnel on nelabvnet. 21. 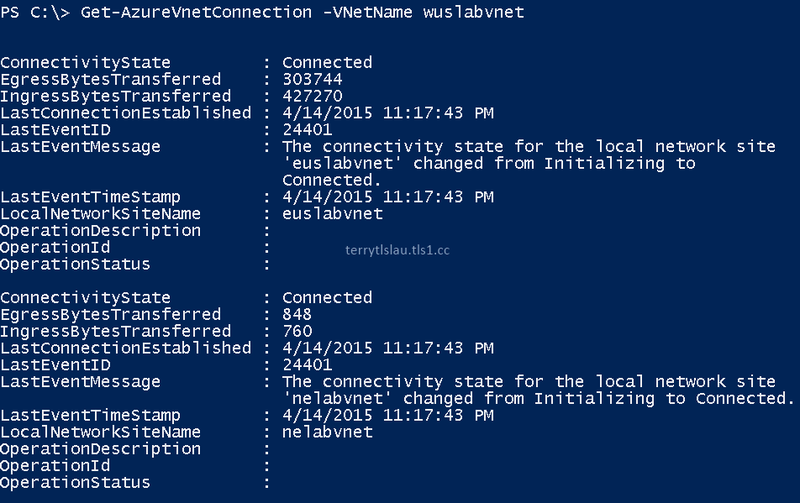 Perform "Set-AzureVNetGatewayKey -VNetName wuslabvnet -LocalNetworkSiteName nelabvnet -SharedKey $Gwkey" to setup VPN tunnel on wuslabvnet. Eventually, wuslabvnet connected to euslabvnet and nelabvnet. Please note that virtual machines under wuslabvnet can communicate with euslabvnet and nelabvnet. 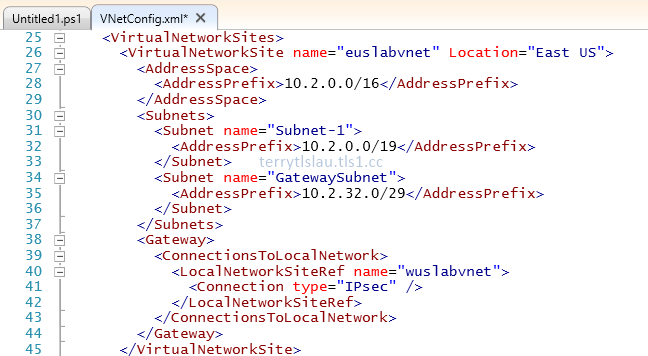 However, virtual machines under euslabvnet and nelabvnet cannot communicate with each other because we didn't add "Local Network Site Ref" into VNet configuration file and configured shared key. To communicate between euslabvnet and nelabvnet, we updated the VNet configuration file and then upload to Microsoft Azure. After that, configure shared key on both sites. Eventually, virtual machines under euslabvnet and nelabvnet can communicate with each other. By default, the Azure Gateway SKU is Default. It supports S2S VPN throughput to 80Mbps and 10 S2S VPN tunnels. It costs $0.036 US dollar per hour. Except Default gateway SKU. Microsoft Azure provided High Performance one. It supports S2S VPN throughput to 200Mbps and 30 S2S VPN tunnels. It costs $0.49 US dollar per hour. To update the gateway SKU, we can perform "Resize-AzureVnetGateway -VNetName <virtual network name> -GatewaySKU HighPerformance". Eventually, the virtual network was changed to High Performance.